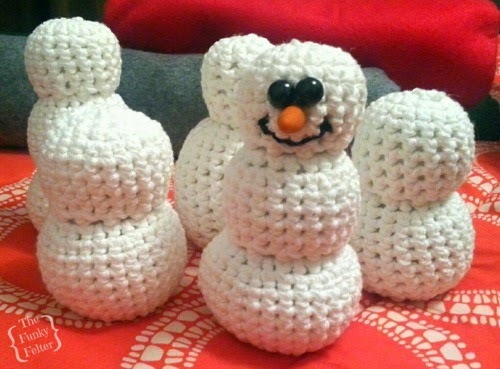 If you saw my last WIP Wednesday post, then you know that I kind of got ahead of myself and stuffed my crocheted snowmen before turning them right side out - now I have several wrong-sided or "outy" snowmen. Oh, well, it happens when crafting like a maniac! So here's my new progress report to share. I added even more to the little army of "outy" snowmen and am now putting on faces and other embellishments. Woohoo! Now this is where I get to give each of the little guys or gals personalities and I love this part of the process! I even hand sculpted the carrot noses from polymer clay (that craft tutorial is coming up next week if you're interested). To see what my snowman army ends up like, please stay tuned over the rest of November and beginning of December (geez, it is so close, isn't it?). 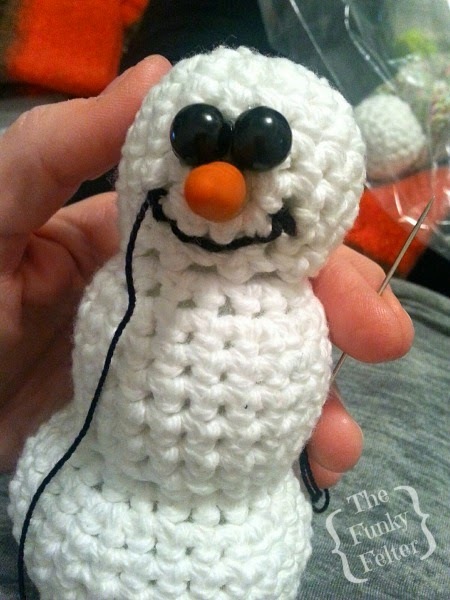 In the next few weeks, I'll post photos of finished little crocheted snowmen and also a few brand spanking new FREE crochet patterns for amigurumi holiday crochet figures and other crochet projects I've been working on. Yes, the funky felter puts down her felting needle to crochet occasionally - especially for upcoming holiday gifts! Be sure to follow me or subscribe to my feed through the subscription box on the side to get those upcoming posts. Don't miss out!